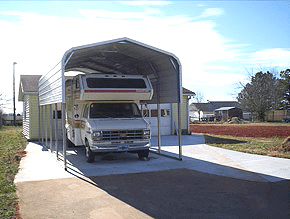 Here is a 14’x40′ carport with one side closed and one side partially closed. 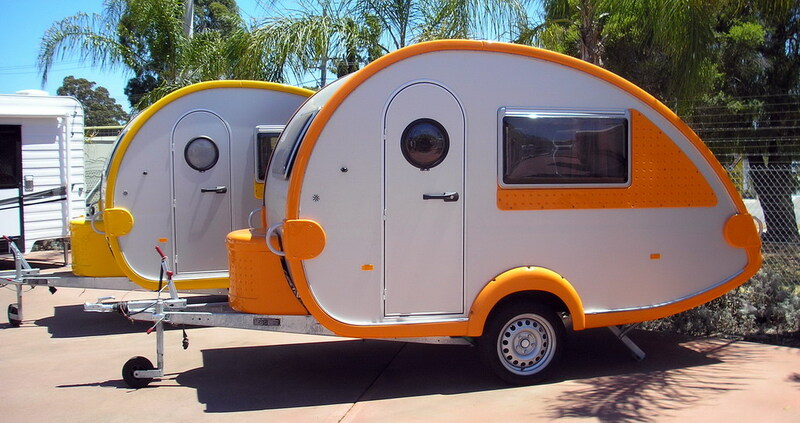 Notice how the length provides plenty of room for a 5th wheel and a tractor. This size of car port would be great to store an RV also. 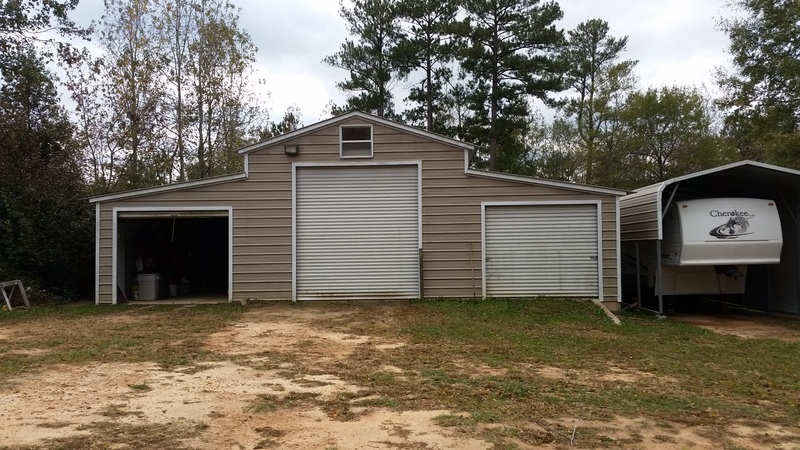 A metal barn; the dimensions are 42’x40′ with three roll up garage doors. (To the right of the barn is a 14’x40′ carport with a 5th wheel inside). 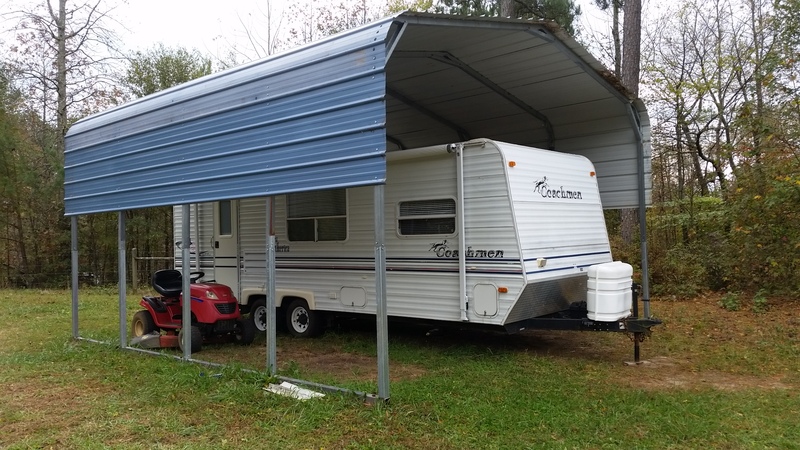 Car port: 18′ wide x 21′ long x 9′ leg height covering this camper trailer and riding lawn mower. Sides are partially down on this carport. 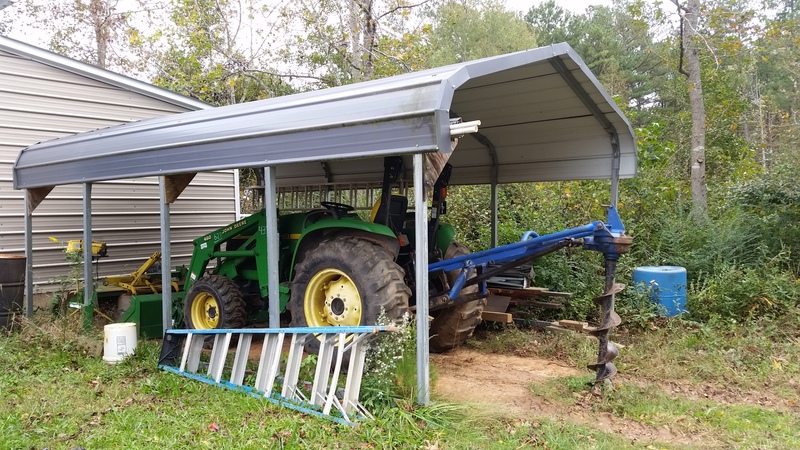 This carport covers a tractor (with auger attached). How many cool houses have you seen? Do you like to browse through magazines designed for the home? Do you like to look at photos of fantastic, gorgeous living spaces on Pinterest? 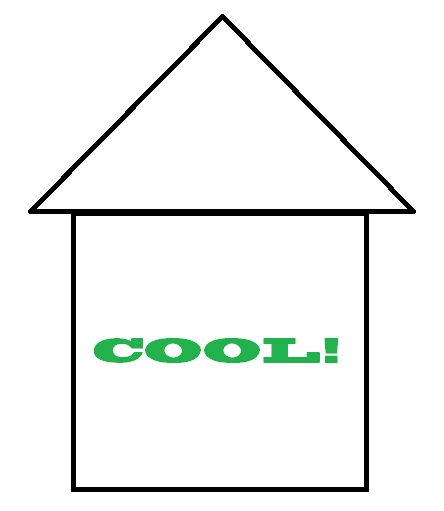 Notice “The Best of Cool Houses Daily” from the HGTV Front Door website. “The Best of Cool Houses Daily” | HGTV FrontDoor – © 2014 Scripps Networks, LLC. All rights reserved. ©2014 Pinterest. All rights reserved. External links from this post are property of © the copyright owner and used under fair use. My husband also rescues honey bees within the state of Georgia when pest control companies are called or even 911 emergency regarding bees. My husband goes out and rescues a honeybee hive if someone calls, for example, and has bees nesting in the walls of their home, their chimney or a tree on their property, etc. Interestingly, it is not illegal to kill honey bees, per the Georgia Department of Agriculture website which states, “This is a common misconception, even within the pest control industry. Although the Georgia legislature named the honey bee as the state’s ‘official’ insect, the designation does not offer any legal or regulatory protection.” For many people, the common myth that it is illegal to kill honeybees does save many hives and colonies of bees. My husband has been working on a solar wax melting project. He is re-purposing household items to use in the process of making something to naturally melt beeswax. Beeswax is anti-inflammatory, antibacterial, anti-allergenic, and has germicidal antioxidant properties which make it beneficial for wound healing too! Re-purposing beeswax is effective and productive in many ways, besides also helping bees. Beeswax is not melted down naturally just in order to make candles! I found this to be an interesting topic and thought I would write about this to increase awareness regarding bees, how to work with honey bees instead of against them and how we’re doing our part to help save the bees. 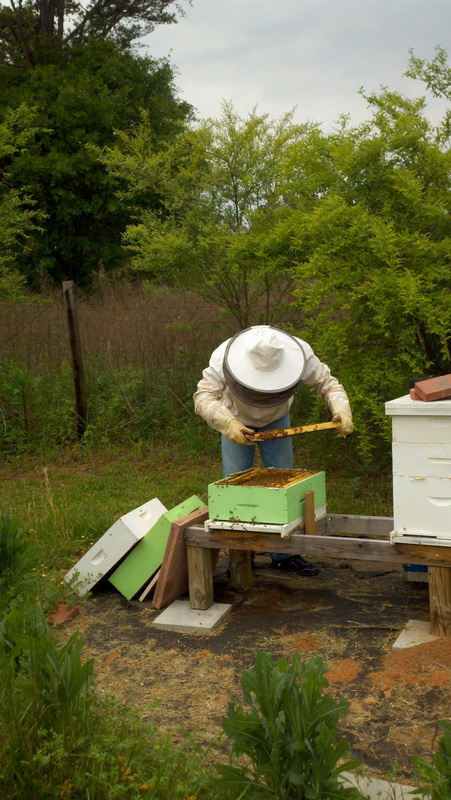 To assist a beekeeper (apiarian), we offer portable storage buildings. Our portable sheds are well suited for the storage of beekeeping supplies (supers, frames, extractors, etc.) as well as keeping honey and even bees themselves! 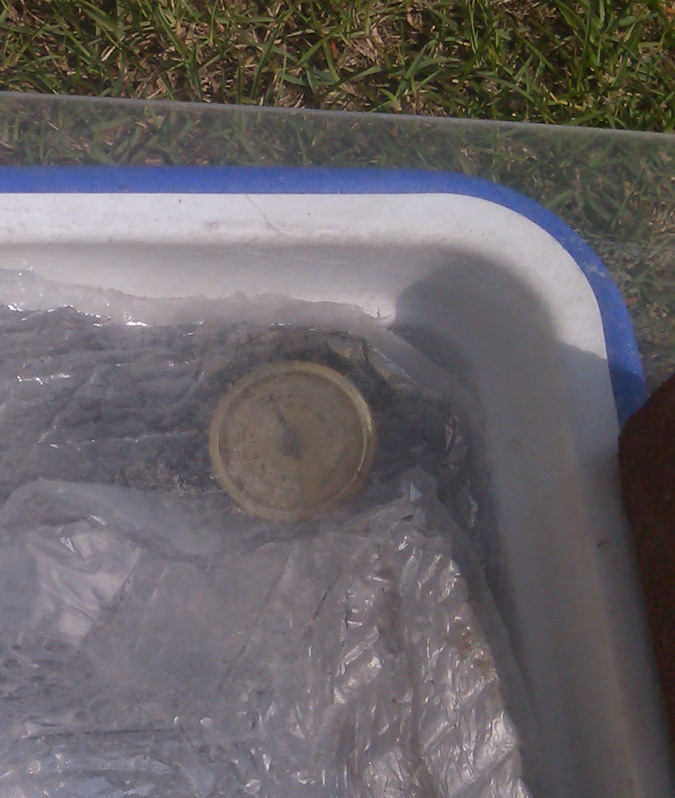 After placing the insulation in the cooler, Josh next put a brass thermometer in order to see how high a temperature was achieved in the cooler. 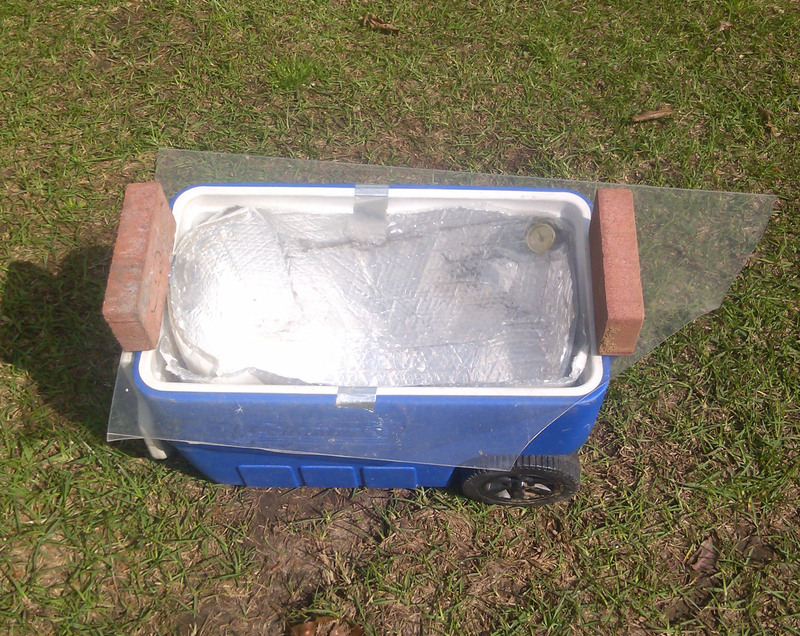 The last few steps were to place a piece of Plexiglas on the cooler and secure it with a common clay brick on each end. This way, there is a clear view into the melter and we can see the temperature easily. Josh decided to try this method and inside the solar wax melter, he was able to achieve 150-170 degree temperatures in less than 2 hours time, on an overcast day at that! Simplify: Downsizing, minimizing or minimalizing and repurposing all bring to mind living within or beneath one’s means, wouldn’t you say? This would make us think of living a simple life, living with less, cleaning up and getting rid of unwanted or unnecessary stuff. Lately this has been on my mind, perhaps because we are now officially into Spring and the weather has been a positive motivation toward getting things done. It has been my goal for some time to have LESS “stuff” in our home, keeping in mind the saying that “Less is more”. This whole concept of simplicity in general may be easier said than done. A lot of us have things that we just do not want, need or can no longer maintain, all “stuff”. Keep It Or Not? One way I have found useful in order to determine if I can do without an item is to put it in a specific place for a period of 6 months. This may seem to be a long period of time and for some items, it is. It may not be necessary to hold on to something for six months, especially if it will not be used or needed again, however this is just for items that I am not sure about. Then, I will set an alarm on my phone and at the 6 month time, go to my designated spot and evaluate whether i need the item (perhaps seasonal clothing, camping items, etc.) If I am still not using the item in question by this time, it can go one of two ways: either it can go directly to one of 3 piles, “donations”, “keep” or “sell” or secondly, it can stay right where it is for another set time period to see whether it will be useful in the future. We can downsize, as mentioned in this article, minimalize in order to live a simpler lifestyle and repurpose the items that we already have, in order to make our lives easier and more green. Storage: Homes in the US just do not seem to be built with sufficient storage for the families that fill them these days. We usually end up with more stuff than we may want or need, but we do need a place to put our belongings. For me, this time-tested idea does require that I have a specific location in my home or storage buildings and garages set aside to be a temporary holding place for “stuff”. I have a GPB storage building, which is easy to set up with labeled sections for items that need to be stored. 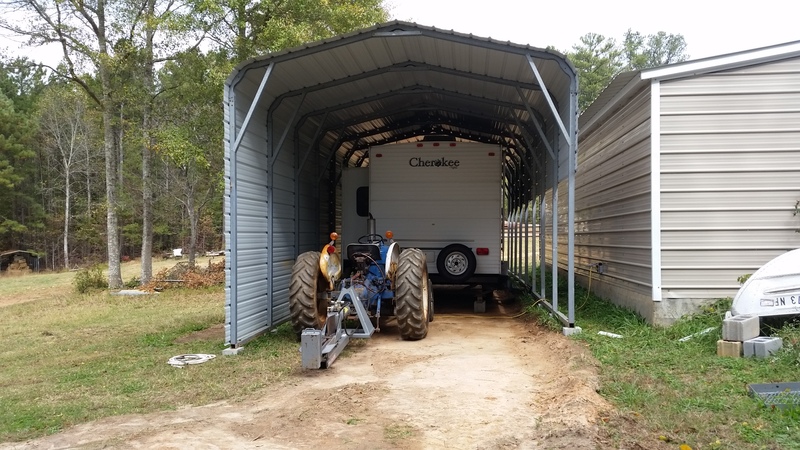 Portable storage buildings from GPB, Inc make a lot of sense because they can be set up and leveled and kept dry and vermin/bug-free. Why would you want to invest in a portable storage building if you are trying to get rid of extra “stuff”? Two reasons to invest in a portable building include: (1) It can be moved in the future if you want to sell it back or trade it in for a larger (or smaller) building, (2) In case your family moves in the future it is fairly easy to move the building as well – so the building can even be a temporary storage place (3) Portable buildings add value to home and property and the building could be sold already installed if you choose. Solve: We are interested in how to solve the problem of too much stuff and not enough simplicity and a great solution is to just make the decision and get it done. We know what we can live with and without and just taking the initiative to solve the problem is really what is required. What if you knew you could buy a car that was nice for your family: it had great safety features, got good gas mileage and was the right size, plus it allowed you to save money to go on a vacation or two extra per year. Even if the car has a few cons or things you didn’t like as much, would you invest in it? Most people would buy that car. How willing are we to part with items (or “stuff”) that could make us money, help others, save us money on taxes or go right into our savings account? Like that great car, we can make sound decisions to solve our “stuff” problem by taking the steps now and deciding what we want to keep, sell or donate. In the meantime, a great step toward solving our storage problem is to look into a portable storage building, garage or utility shed from GPB, Inc., a trusted source for secure and sturdy storage structures across the USA.